Not everybody is going to like competitive gaming, just like not everyone is going to like your favorite roleplaying game. Different strokes, folks, etc. That said, why do competitive games appeal to me? I enjoy the cerebral aspect of it all. That’s why I love baseball. Baseball to me is a game of chess between the pitcher and batter. Always trying to think ahead of and outwit the other guy, based upon past interactions and expectations. Do you like baseball? Or chess? Or other cerebral type games? Then you might actually enjoy competitive gaming! You don’t have to be a type-A, “must-win” kind of person. You just have to enjoy the challenge. Competitive gaming (for me) is more about overcoming my own weaknesses. It’s about learning, adapting, growing, and progressing. Perhaps my favorite memory from the whole Worlds experience was flying from Minneapolis to Atlanta with two other players from the tourney. Three men from three different towns and three different lives–three men who had very different experiences in terms of success at the tournament–we sat there, troubleshooting and brainstorming ways each of our decks could be better. We enjoy the challenge, which means we make the best of defeat and we accept victory with a strong dose of humility. Because you just don’t win until you’ve lost a lot first. At Worlds, everyone kept asking, “Is the LCG your only game? What are your other games?” My answer always began, “I’m actually a roleplayer primarily,” citing my current AD&D and Star Wars RPG games. That surprised most of them, because the majority of them gamed entirely in the competitive FFG scene (Imperial Assault, Game of Thrones LCG, and X-Wing Miniatures primarily). So I consider myself a roleplayer who also plays a competitive game. My favorite kind of gaming experience is one in which everybody walks away with a smile. I don’t like it when players get frustrated, partially because of my personality type, partially because…well, mostly my personality type. I don’t like it when people walk away from the table upset. I want everyone to escape from their busyness, to have a good time, and to look forward to the return. As I’ve played the LCG, I’ve seen people walk away with anything but a smile. Getting whipped week in and week out can get frustrating. Trust me, I know. It used to be me. My first competitive experience was at a Regional Championship in Houston, where I went 1-7. It was not pretty. And I was disappointed! But there were two things that helped me with that disappointment. First of all, the winners were really good sports and were very gracious. In fact, they gave me (solicited) advice and direction on how to improve. And I took their advice and improved! Second, I saw my loss as a place from which to grow. I set some goals, pursued those goals, and overcame. One year later, I placed 1st at our local Regional Championship. Here’s my point: competitive gaming means the thrill of success and the frustration of defeat. It means adrenaline. Man, does it mean adrenaline! And this is a very different experience than my weekly AD&D game. They’re both fun. I love them both! But they’re very, very different. If you’ve had a bad experience with competitive gaming in the past, then that side of the hobby just may not be for you. But then, maybe it could! Just because you didn’t enjoy one game doesn’t mean you won’t enjoy others! My first competitive tabletop game was X-Wing Miniatures. When it got going, I was having fun with it. It didn’t take too much time, effort, or money to enjoy. I could pretty much throw a squad together last minute and have some fun. But as my local group began to grow fairly rapidly, I started losing more and more. What was the problem? Well, I didn’t have the funds or interest in buying every ship and upgrade that released. I just wanted my few little ships and to enjoy that. So after a while, I got out of the game. In the end, I still think it’s a great game. I really like the people with whom I was playing. But I just didn’t have the drive to dig in and become a competitive player. The Star Wars Card Game was different for me. Financially, it wasn’t as much of a commitment. And I liked the thought process better of building card decks, compared to creating squadrons. Oh yeah, I didn’t have to deal with dice either (I’m looking at you, Star Wars: Destiny)! 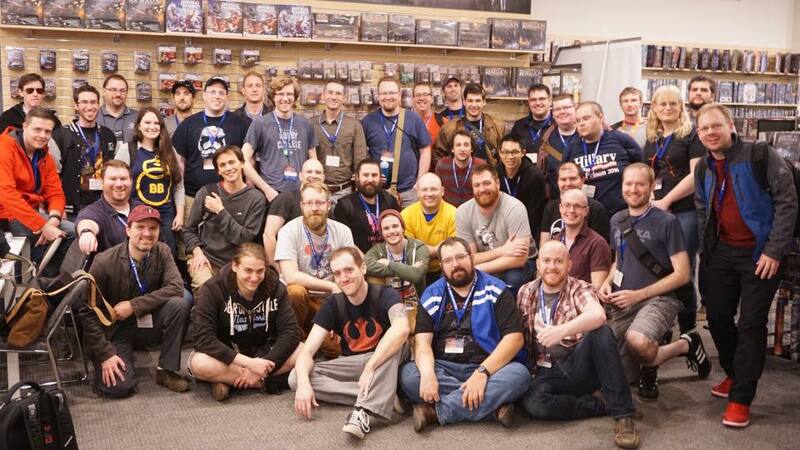 As I expanded into the larger LCG community, I found that I was one among peers. Most of the community was made up of grown-up gamers like myself and most (if not all) of my readers: gamers who are trying to balance their hobbies with jobs or families and other responsibilities. It was a good niche in the competitive world for me and one I continue to enjoy a lot. So here’s my challenge to you: try out one competitive game at your FLGS. Find out what is played with some regularity and just show up one night and ask for someone to show you the ropes. It may be Warhammer 40k. It may be Magic: The Gathering. You might even get lucky and find some LCG or X-Wing players! Just give it a shot and see if it suits your taste and personality! You may find a gaming experience that you really love and have been missing out on. In my heart, I’ll always be a roleplayer. But every Wednesday night, I’m a competitive card player. And next May, I’m going back to Worlds, because I can’t quit at #35. Again, that’s just my personality. What has your experience been in competitive gaming? Any games you’d recommend for the other gamers in the crowd? Sound off on my Facebook page! I think fundamentally I am not competitive. I don’t respond well to criticism in my gaming. But I respect those who love it! What competitive games have you tried out, Eric?